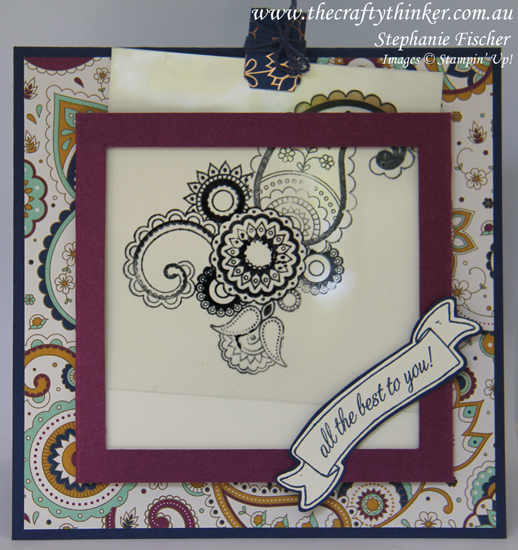 Welcome to our World Card Making Day Blog Hop using current Stampin' Up!® Products. This is such a fantastic way to celebrate this event with lots of amazing inspiration for you. You are currently visiting my blog - Stephanie Fischer in Australia and you will be visiting lots of different places in your hop today. There is a list at the end of the page which will help you to move along from blog to blog so you see 20 amazing projects all up. I just adore the Paisley Suite of products and use them every chance I get! Today I've used them to create a magic card. Lack of time led to impatience which caused some lifting of the Stazon Ink - Lesson learned! Pulling on the tab reveals the paisley pattern in all its colourful beauty! Hey presto! The colourful image. To make the base card, I cut a 12" square of Night of Navy cardstock in half to 12" x 6" and scored and folded it in half at 6". 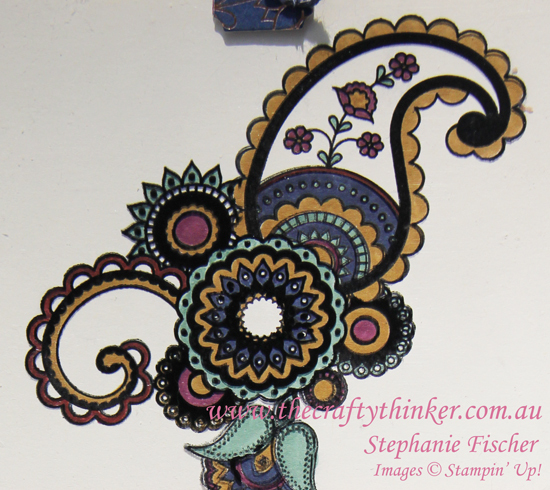 I then added a 5.75" square layer of Petals & Paisleys Designer Series Paper. 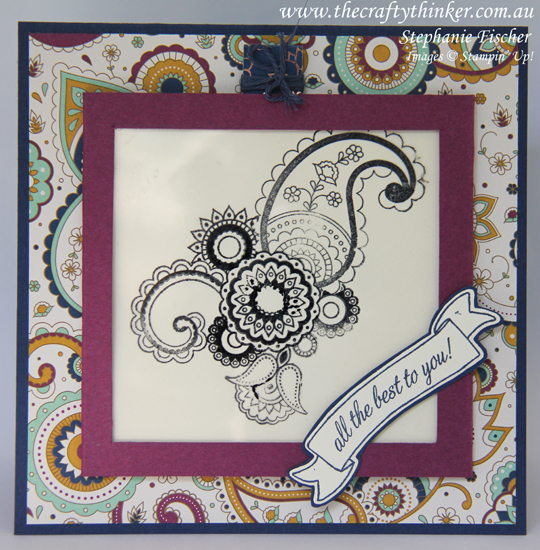 I attached the magic part of the card to the centre of the paisley layer. To make the magic section of card, I basically followed the great video tutorial by Brandi Barnard with a few little changes. I cut a piece of Rich Razzleberry cardstock to 12" x 4.5". Like Brandi, I scored one side of the cardstock then measured 4.5" from the score line and scored again. I also followed Brandi's suggestion to create a bit of depth for the mechanism. 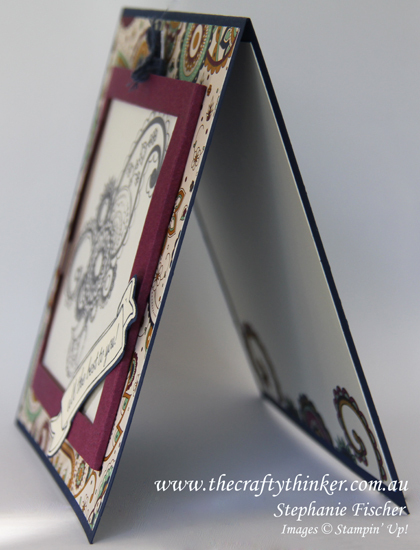 I decided I wanted a smallish frame of Rich Razzleberry around the stamped image and so I made it 1cm wide - not to be confusing but because the vertical ruler on my Stampin' Trimmer is metric only! So I cut the centre from the front of the magic card, leaving a 1cm edge on all sides. One of the other changes I made was to add a piece of Very Vanilla cardstock to the centre of the mechanism rather than use another piece of Rich Razzleberry. I cut the Very Vanilla piece 1/8" smaller just to make my life a little easier! Then I simply followed Brandi's instructions to finish the magic card. I used Fast Fuse to stick it to the card base to better withstand all the excited playing with the magic! The addition of colour makes so much difference! To create the stamped image for the magic card, I used a variety of the stamps in the Paisleys & Posies stamp set with Basic Black Archival Ink onto Very Vanilla cardstock, masking as I went. I coloured the images with a variety of Stampin' Write Markers (Mint Macaron, Delightful Dijon, Night of Navy and Rich Razzleberry). The masking is a little bit awkward when it comes time to stamp the same images onto the Window Sheet with Stazon ink. I would recommend using some washi tape to hold the Window Sheet in place and also to leave yourself some drying time for the Stazon before applying a mask and adding the next stamp. I was a bit short on time and consequently some of the ink lifted when I removed the masks. 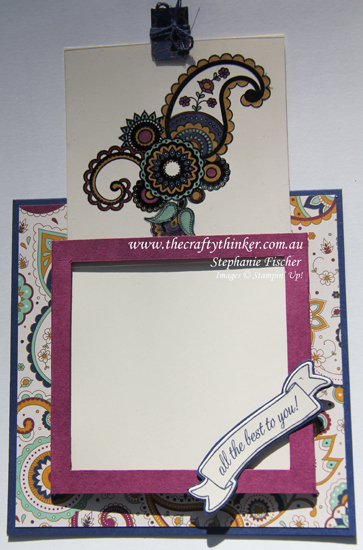 I added some paisley to the inside of the card too. I stamped one of the banners from the Basket For You hostess set using Night of Navy ink on Very Vanilla cardstock and cut it out with the matching Bunch of Banners framelit. I then stuck the banner to a piece of Night of Navy cardstock and trimmed around the edge with my snips. I attached the banner to the magic card, being careful to get the glue dots on the Rich Razzleberry frame and not on the Window Sheet! Thanks for visiting my blog today, there are so many amazing ideas and inspiration you don't want to miss. Remember that currently you are at my blog - Stephanie Fischer, so check the blog hop line up list to see who is next in the list. Enjoy World Card-Making Day!